Suitable for puppies, dogs, kittens and cats. Effective against roundworms. Multi-use pack,suitable for treating whole litters and dams. 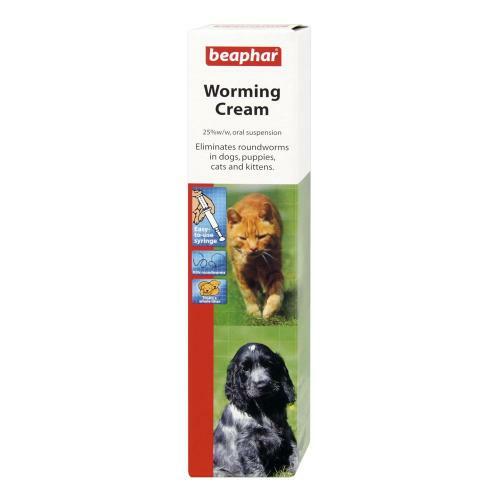 Also suitable for older pets that do not like to take tablets. Can be administered directly into the mouth, applied to a paw, or mixed with a little food. WARNING – DON’T FORGET FLEA CONTROL! Fleas are often infected with the larvae of the Flea Tapeworm, which can be transferred to your pet by swallowing the flea while grooming, or by coming into contact with other animals. In order to control worms, you also need to control fleas. A Spot On treatment is the easiest way to protect your dog – but you may also need something that kills flea larvae in your pet's surroundings, to effectively break the flea lifecycle. If you don’t control a flea problem at the same time as worming, your pet is almost certain to be re-infected.